A subwoofer is going to be able to give you the added bass you’re looking for and allow your regular speakers to concentrate on providing a loud and crisp sound, while your subwoofer takes care of the low notes. In a marine environment, extra qualities are needed and getting the best marine subwoofer is vital. 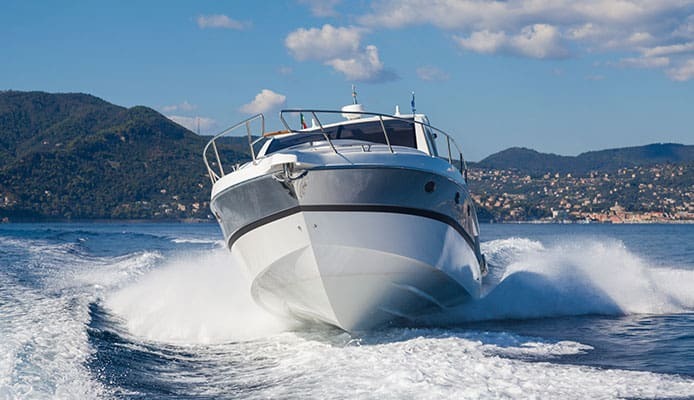 In order to get the best boat subwoofer, you have to not only take into account the quality of the sound but also key aspects such as the power rating, installation and impedance. Here we look into those key features and have also completed marine subwoofer reviews to show you the best products available. 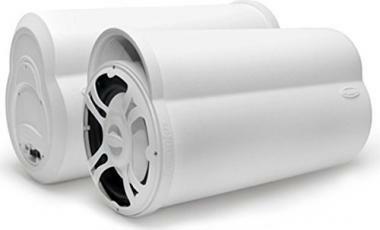 These are stylish bass tubes that are going to be able to dramatically increase the performance of your sound system. They will be able to add a great level of bass and allow the sound to travel throughout your boat. They are available in sizes of either eight or 10 inches and are also available as 100 or 250 watts too. The casing is made from stainless steel and they are going to be able to be easily installed. They are marine quality and able to cope with UV rays. 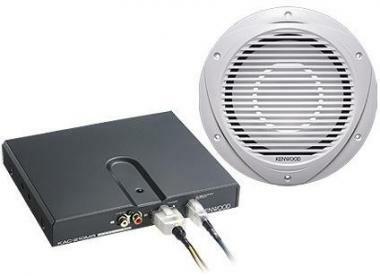 This is a top rated boat subwoofer from Kenwood and is going to make a very large level of sound with its 10 inch size. 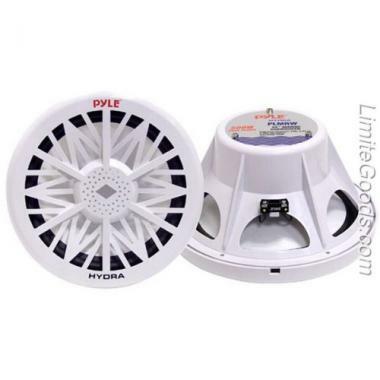 It runs of 200 watts and will be able to dramatically increase the overall quality of your marine sound system. 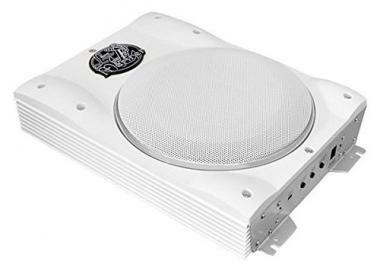 The product comes with both the subwoofer and the amplifier to give your system a boost and the speaker is marine-grade quality and able to perform to a high standard in the harsh environment. This is a brilliant speaker and one that will do a great job. This marine powered subwoofer is available in a range of different size options depending on your needs. It comes in either 8, 10 or 12 inch diameters allowing you to perfectly match the needs of your boat and your sound system. They are very powerful and able to pump out a high level of sound. They are water-resistant to be able to deal with the conditions and will be also be able to deal with water splashes. The speakers come in a white design that is going to look great. In terms of subs for boats this is one of the best products on the market and comes in a unique design as it has a much lower profile. That allows you to place it in a discreet area such as under a boat seat to still get that sound quality. The speaker is 8 inches and has a waterproof construction to be able to deal with everything that a boat might throw at it. Another great feature of this subwoofer is that it has built-in safety features to ensure that it doesn’t overheat or shortcut. This is another product from Bazooka that is going to be able to pump out a high level of bass. It is available in sizes of either 8 or 10 inches and the ported marine quality bass tube is going to give you a high level of sound quality and a high level of durability. It has 150 watts of power handling which should be good enough for most boat applications and that sound is going to be able to carry very far. The subwoofer is highly weather resistant, giving you confidence that it is not going to fail. Clarion have been able to produce this great marine grade subwoofer that is going to be able to produce a high level of power and a very high volume of sound. That comes from the 350 watts of power handling that it has and also the overall quality of the speaker. It has a single 4 Ohm voice coil and is a mica-injection polypropylene cone woofer. The rubber surround that it has is going to be able to resist the marine environment and give you a high amount of durability when you are out on the water. This waterproof marine subwoofer is another one that has a very low profile. That will allow you to have a very easy installation, allowing you to set-up the subwoofer in a number of different locations depending on your needs. It is highly durable as it is waterproof and weatherproof, meaning that this is a product that should be able to last you for a very long time. It has a large number of safety features too, allowing you to buy the subwoofer with confidence. This is a great subwoofer for boat and one of the most highly rated products that are out there on the market. It has a long list of great reviews so you know that you are going to be getting a high-quality product that will last you for a long time. 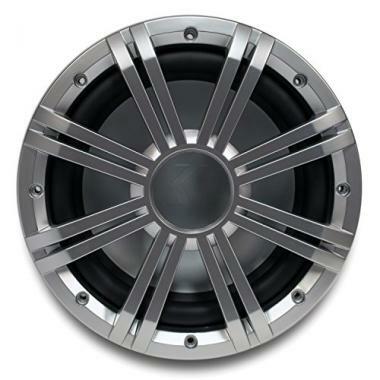 It is 10 inches in size and is also one of the most stylish subwoofers on the market and it is going to look great once it is installed into your boat. Overall this is a great product that is going to perfectly match the needs of your boat. Whereas most of the products that we have looked at here are very light in color, this is one that takes on a much darker look with its black finish. That is going to make it the ideal solution if that is the look that you are going for. 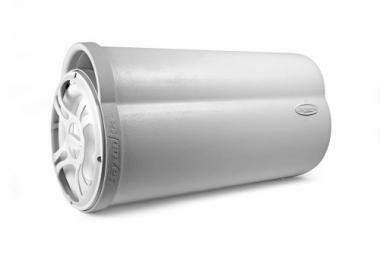 It is 10 inches in size and has a power handling of 270 continuous and 540 watts at its peak. The product has been designed with the marine environment in mind, meaning that it is highly durable and able to withstand difficult conditions. 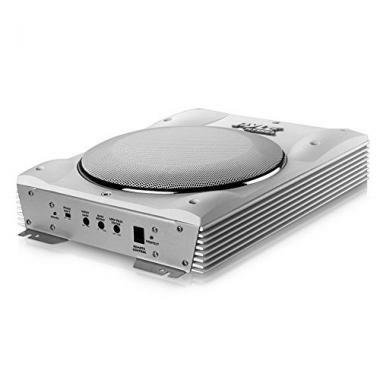 This is a 10 inch marine subwoofer that comes with a stylish silver grille which is part of the great overall looks of the product. 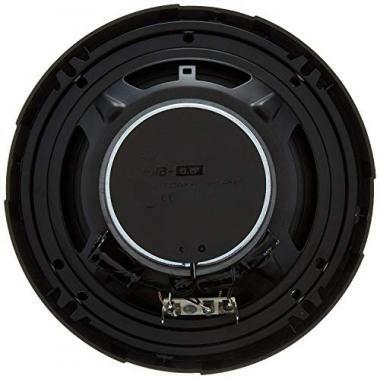 The subwoofer has been designed specifically for marine use and therefore the sound carries very well. It has an injection molded cone and the whole product his highly weatherproof and is resistant to UV rays. Overall this is a high-quality product which is going to help drastically improve the sound while you’re on a boat. In terms of placing a speaker on a boat, the power of the product is going to be of particular importance. Due to the sound most likely having to travel through the open air, it needs to be powerful enough to be able to cut through it so that you can enjoy the music. In terms of the watt power of these devices, this is generally measured with two different numbers as you will see a lower number and then a higher figure. The lower figure will represent the ‘RMS’ of the speaker which stands for root mean square. This measurement will give you the best value of waveform which is an important piece of information when it comes to the recommended power rating. The other figure will be the peak power rating and that is always going to be the higher figure of the two. This is basically telling you how loud it is going to be able to go before the device can no longer handle it. For larger boats, a higher amount of power would be needed as you would have more space in which the sound would need to carry. It’s important to note with these power ratings is that in order to get the most out of your subwoofer, you would need a stereo unit and amplifier that are going to be able to cope with an increase in sound volume when you are on the boat. Another important electrical measure when it comes to your marine grade speakers is going to be its level of impedance. This is a measure of electrical resistance and related to the amount of power that your speaker is going to be able to accept from your amplifier. In general, you want to have a speaker that has a lower level of impedance as a 4 ohm speaker is going to be able to extract more power from the amplifier than a 8 ohm speaker and therefore this is going to be important if you want a great level of sound. An important note here though is that the level of impedance should match that of the amplifier. The reason for that is if it is too low then the amplifier can overheat and if it’s too high the output tube or transmitter can be damaged. Therefore it’s important to get a good match. Before getting any product for your boat you need to make sure that it is going to be able to be installed easily into your existing fixtures and fittings. 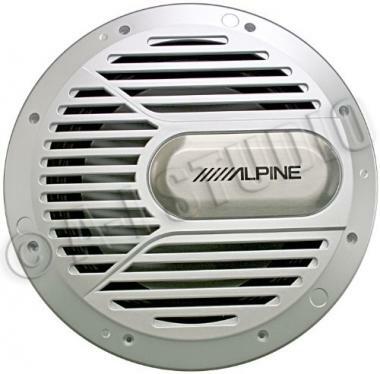 You also want to make sure that it fits in with your existing marine speakers that you have. In terms of installation you have three options as you would either be able to get a plug in and play model that can be easily connected, you can do the wiring yourself or you can hire a professional to do the job for you. Perhaps the most difficult part of installing the subwoofer is going to be the mounting of it. You want it to be able to match your marine stereo and you also want it to be able to fit in and fit properly too. This can be tricky for some, especially if holes need cutting. At this stage, if you are unsure of how to do it then it really would be the best idea to call a professional. 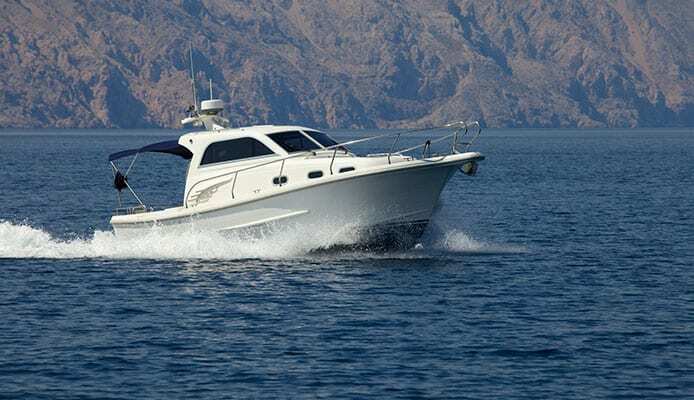 If not, you simply want to make extra care as any mistake could leave a lasting mark on your boat which is something that you obviously want to avoid. When something is described as marine grade then it is expected to conform to a higher standard than any other type of speaker. The obvious point about this is that it has to be at least water resistant in order to be able to deal with the splashes it will inevitably have. If your subwoofer isn’t water resistant then you are going to have huge problems and this equally applies to your speakers, stereo and your battery too. The build quality on these products has to be high in order to deal with the conditions. Aside from the waterproofing, there are other aspects that these materials need to deal with as well. 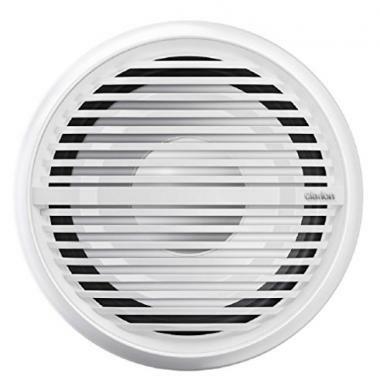 The salty air can start to corrode any exposed metal and also if the subwoofer is in direct contact with the sun then the UV rays could well damage it. It’s important to guard against all these potential dangers and the best marine subwoofers are going to be able to do that to a very high degree of quality. Some products are going to be better than others though and these are aspects that you will want to check before you buy. Q: Why Do I Need Marine Subwoofer? A: If you care about the sound that is going to be coming out of your sound system then you are going to want a subwoofer to be able to give you the best quality possible. Often subwoofers are connected to people who love to thump out a heavy bass but on a boat they are more important than that. It’s likely that your subwoofer and speakers will be trying to carry that sound through the open air and it can easily get lost if it is too windy or the conditions aren’t favorable. A subwoofer will allow you to have the best sound quality possible. You want to make sure that you have the best battery to be able to deal with the power output and if you do, you’re going to quickly see why getting a subwoofer was a great idea as they will vastly improve your sound system. Q: What If It Gets Wet? A: Even though these products are marine grade, a lot of them aren’t actually waterproof. They will though be designed to be able to cope with rain and splashes as they won’t succumb to that type of water. All these products listed have a good amount of water resistance but if you are particularly worried about it then it’s a good idea to find a subwoofer that is going to be able to give you a full amount of waterproof protection. Getting a subwoofer is a great idea for your boat. It’s going to be able to increase the sound quality that you are able to produce and most likely increase the volume too, and this is going to make the whole experience even better. Whether you are having a party and firing up your boat grill or simply just relaxing, a good sound system is a great thing to have. With a subwoofer though, it’s always going to be vital to match it up to the other sound products you have. Once you are sure of that, you will be able to choose the best subwoofer for you and enjoy the higher level of sound you are going to get. All that’s left to do is get it installed and start making the most out of that great bass you will now have.